Just noticed the sad news. You never know when it will be your last day on earth. There are many ways a person's influence can live on. I'll forever remember the stories Tom shared. I recall recommending on page one of this thread that he write a book, and I hope it can still be put together. I know many who don't use the internet that would enjoy the printed word. I just finished reading this thread. It felt like a knife in my heart when I read he died. I loved this thread, and hearing of the life he LIVED. I bought some of the books he suggested, and am enjoying them today and forever. I can only hope to be as great a man and soul as IDAMAN. He is off to a new adventure, one we all make someday. Be that Idaho Man, he is The Man. From far away I pay my respects to Idaman's family and friends. Somehow I was fascinated by his stories, and when I read that he had passed away, a part of myself did the same. Prince Blanchard 170 our first bull from Carl Martin. Geez......how old are you today? Man that's a bull. World was more right then too. Oh my gosh I LOVE this picture. Looks like a bull my Grandpa had. He sold his Holsteins and went into Herefords in the 40s. 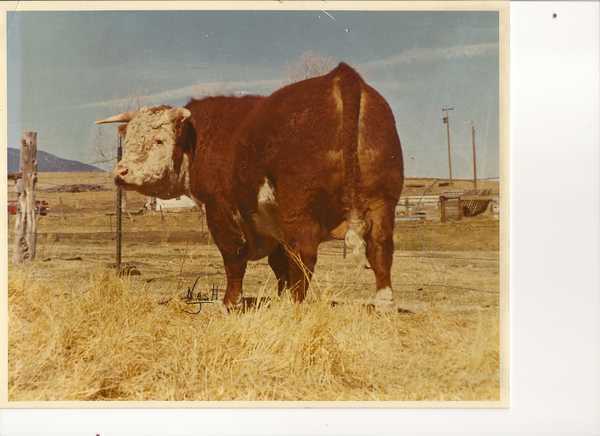 CKC1586 wrote: Prince Blanchard 170 our first bull from Carl Martin. That's funny Cathy my grandfather sold his sheep(as soon as the ranch was paid off) and went to Herefords in the early 40's. FWIW he (my grandpa) bought cattle from the Deewal's at some point. According to my Dad anyway! Grandpa and Grandma had dairy cattle but were milking by hand, Grandma decided they were getting out of the Holsteins because she was not gonna spend the money on milking machines, she was clearly the boss of the place and everyone knew it. They raised some fine Herefords. They gave my brother a beautiful heifer for his 13th birthday and he built a herd that when he sold it at age 19 he bought a little farm down the road from our homestead. jedstivers wrote: Man that's a bull. World was more right then too. I'm a little sad about never knowing this man, seems like he had a great soul. Wasn't there some talk about a book being done on his stories? that would be awesome. I would buy it. Fans of Idaman will be happy to know that a book compiling his posts is in the works. It's been a labor of love over several years as it has had to fit around my schedule, but we're almost ready to send it to a publisher. If you would like to be notified when it's available, please email me at gbrumbelow@gmail.com. I made this offer several years ago but was way too early, so I have lost track of requests that came at that time. If you would be so kind as to send again, that would be good. gbrumbelow wrote: Fans of Idaman will be happy to know that a book compiling his posts is in the works. It's been a labor of love over several years as it has had to fit around my schedule, but we're almost ready to send it to a publisher.